Many modern alloy wheels have a machine faced finish. What this means is that the face of the wheel has been cut using a CNC machine and is then clear coated. The inserts of the wheel are usually painted a gun metal grey or black colour. You can tell if your wheel has this finish by the shine that it has and the tiny cut lines on the face of the wheel if you look closely. This type of wheel can be very costly to replace with genuine wheels ranging from $600 per wheel all the way up to $3000 per wheel. To repair these types of wheels back to a factory finish requires the wheel and tyre to be removed from the car and the face re-machined on a CNC and a clear coat to be reapplied. This is a costly and time consuming process costing around $300 per wheel and taking up to a wheel to be repaired. Fortunately, at Platinum Wheel Repairs we are able to achieve the same look at a fraction of the cost and with the convenience of leaving the wheel on the car. This means you can drive your car as soon as the repair is complete. With repairs starting from as low as $99 +GST getting your wheels looking like new again won’t break the bank. Using our mobile alloy wheel repair technology we can remove the damage, match the colour and re-apply a clear coat leaving your wheel with a high quality finish and protection from corrosion. This will leave your wheel looking close to a factory finish, however if you look closely you may see a small difference where the wheel has been repaired. Once you step back you will see no difference. The majority of the repairs we do at Platinum Wheel Repairs are machine faced alloys and with hundreds of satisfied customers we can help you save a lot of time and money repairing your mag wheels. 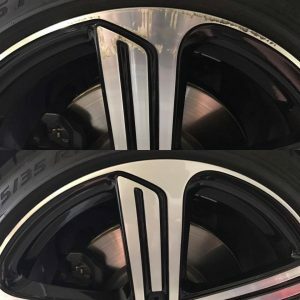 Visit our contact page today to find out how to get a fast quote fro your rim repair in Sydney or take a look at our gallery to see some of our machine face alloy wheel repairs.